Velvet Paw Creations: "Is It Spring Yet?" - New Blockheads Blog Hop Challenge - Bleach Rubber Stamping Technique! "Is It Spring Yet?" - New Blockheads Blog Hop Challenge - Bleach Rubber Stamping Technique! It's Challenge time again over at Blockheads Paper Arts! My team mate, Leslie, is hosting this one and it's all about using bleach with your rubber stamping and you can see her awesome technique demo and the Challenge details on the Blockheads website here. I had an absolute ball playing with the bleach and seeing how each colour cardstock magically reveals a new colour. This is another oldie technique like my Chalk Attraction technique which I hosted last month and it was loads of fun getting re-acquainted with it. I had forgotten how much fun it is to paint and stamp with bleach and I think newbie stampers and seasoned stampers a-like will enjoy this Challenge so I hope you'll come and join the blog hop for a chance to win a $25 gift certificate to Blockheads Paper Arts! You can even submit your entry to the Blockheads' Gallery if you don't have a blog and be in the running for a 4" x 5.25" stamp set of your choice...how cool is that!! The floral medallion and blossoms I used are from Blockheads Paper Arts exclusive stamp set called Nature Medallions and a grungy corner stamp from the Grunge It Up set and I also continued with more Crafter's Workshop Template fun and incorporated the Mini Time Collage into my design as well as a Clock Texture Fades embossing folder by Tim Holtz! Start by stamping the 3 images onto dark blue cardstock in black pigment ink and emboss with black embossing powder. Carefully apply the bleach to ensure you stay within the embossed lines but it's not a train smash if the bleach goes beyond because I cut out the images. I used a Tiny Touch applicator. Apply more bleach in some areas to get a mottled effect coz the cardstock gets lighter or paler the more bleach you use. Colour the images with water based markers like Marvy Le Plumes. I used Citrus Yellow, Wine and Plum from the Victorian set. I even went back in with the bleach after I coloured to bring out more of the bleach background which created a really nice effect. 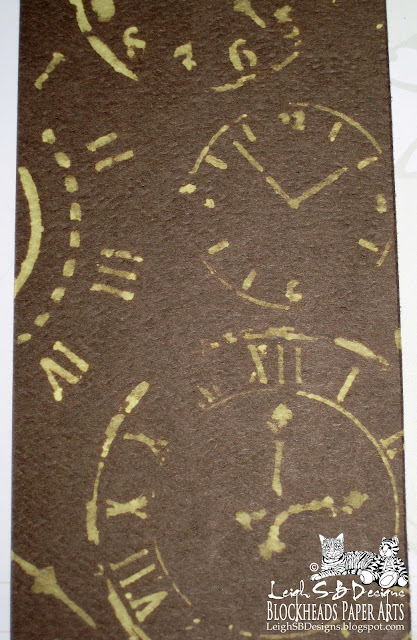 Emboss a sheet of dark red cardstock with the Clock Texture Fades embossing folder and bleach all the embossed areas. Also vary the amount of bleach used to achieve a distressed mottled effect. Use the Crafter's Workshop Mini Time Collage Template as a stencil and bleach the design onto a sheet of brown cardstock. Trim both backgrounds and adhere together to form one panel with a piece of double sided tape on the back. Make a folded card from dark blue cardstock and distress just the right hand edge of the front with the Distress Tool. Apply bleach randomly all around the distressed edges of the background panel and down the distressed edge of the card. Adhere the background panel to the card with double sided tape. Adhere the floral medallion and large blossom to the card with double sided tape and the small blossom with a pop dot for dimension. Embellish the centers of all 3 flowers and the two left hand corners with 3D black Enamel Accents for even more dimension! Have a fantastic weekend and Happy Stamping! Oh, Leigh, I love it!! I had the same idea of using an embossing folder on one of mine I'm going to tackle in the morning! Woo-hoo! This is great! Good thinking to use the Crafter's Template with the bleach, Leigh! I like how you used two different strips of cardstock, too, to show off what bleach does to different colors. And your instructions were very clear, and easy to understand. Great job! This is a very different card with the two colour background, very nice!